▲ Labor unions organized a campaign, demanding full payment of overdue wages in fashion industries. “We present you with the award for abusing young job seekers who just entered the fashion industry.” The award was presented by unionized fashion industry workers on January 7 to Lee Sang-bong, a prominent fashion designer. According to an online poll, Lee garnered overwhelming votes for his abuse of youth passion and labor, paying below the legal minimum wage to his trainees. Companies that hired young people without any prospect of becoming full-time employees came under fire. The employers take advantage of the enthusiasm or passion of young workers, sapping their efforts to unscrupulously save money while earning profits. This situation is not new and was even the plot of the movie Drunken Master which was based on a student-instructor relationship. Hwang Bi-hong, the student in the film, was willing and able to do his best without any worries about his future even if he was not paid for doing odd jobs all day, a version of the so-called passion pay. This was possible because his relationship with his instructor was based on mutual trust and respect. In reality, this type of relationship does not exist between employers and young workers these days. The relationship is most profitable in the long run when both sides, employers and employees, work to build up a pattern of reciprocal benefit. Passion pay, however, does not guarantee employees’ financial rewards or even their future employment. The trend of exploiting young job seekers as cheap labor has permeated not only private companies but also public organizations. Labor exploitation is rampant in areas that need apprentices. Sweatshop conditions especially in the fashion industry are worse because of its narrow industrial base, forcing workers to remain silent despite its poor treatment. According to a survey by The Hanyang Journal involving 350 Hanyangians, over 60 percent answered that it is difficult to speak out against unfair treatment. Imbalances between domestic supply and demand have exacerbated the problem. In 2010, there were approximately 55,000 designers in Korea's design market, in contrast to 232,000 in England. Moreover, the newly hired Korean designers number about 24,000, while there are only 19,000 in England. This shows how difficult it is for England to recruit people, which has led to a better treatment of workers there. Young workers in Korea are at a disadvantage because there are lots of other people who need jobs, making existing positions easily replaceable. “Passion pay is due to the combination of an economic depression, employment instability and labor market polarization. 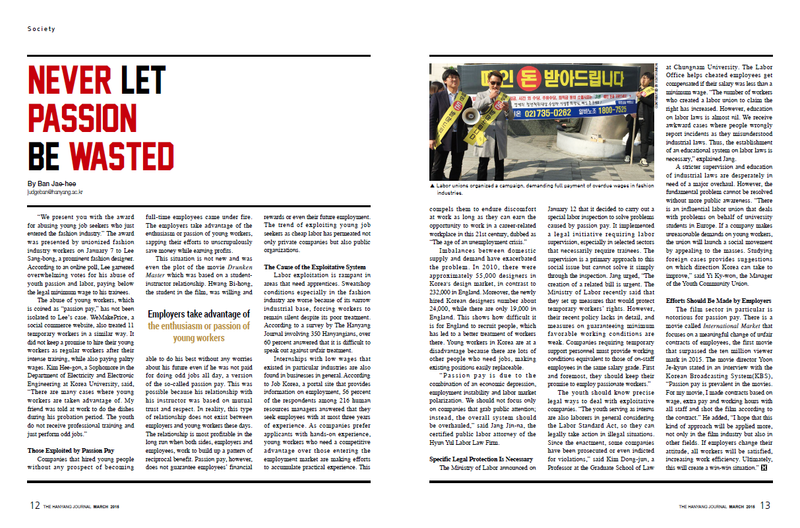 We should not focus only on companies that grab public attention; instead, the overall system should be overhauled,” said Jang Jin-na, the certified public labor attorney of the Hyun Yul Labor Law Firm. The youth should know precise legal ways to deal with exploitative companies. “The youth serving as interns are also laborers in general considering the Labor Standard Act, so they can legally take action in illegal situations. 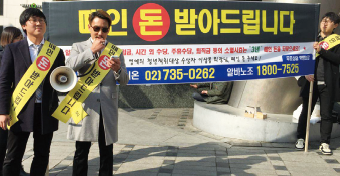 Since the enactment, some companies have been prosecuted or even indicted for violations,” said Kim Dong-jun, a Professor at the Graduate School of Law at Chungnam University. The Labor Office helps cheated employees get compensated if their salary was less than a minimum wage. “The number of workers who created a labor union to claim the right has increased. However, education on labor laws is almost nil. We receive awkward cases where people wrongly report incidents as they misunderstood industrial laws. Thus, the establishment of an educational system on labor laws is necessary,” explained Jang. A stricter supervision and education of industrial laws are desperately in need of a major overhaul. However, the fundamental problem cannot be resolved without more public awareness. “There is an influential labor union that deals with problems on behalf of university students in Europe. If a company makes unreasonable demands on young workers, the union will launch a social movement by appealing to the masses. Studying foreign cases provides suggestions on which direction Korea can take to improve,” said Yi Ky-won, the Manager of the Youth Community Union.